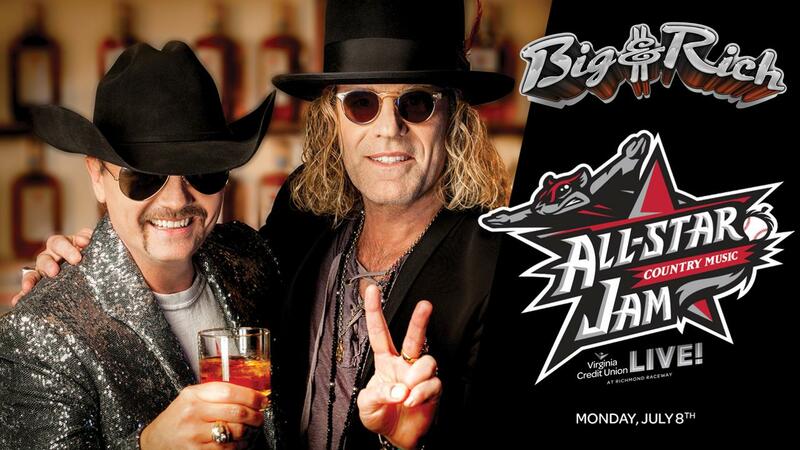 FUNNVILLE - The Richmond Flying Squirrels and Richmond Raceway will host the All-Star Country Music Jam headlined by Big & Rich with special guests Cowboy Troy and DJ Sinister at Virginia Credit Union LIVE! at Richmond Raceway on Monday, July 8 at 7 p.m. as part of the 2019 Eastern League All-Star Week presented by Genworth. Tickets will go on sale to the public online at vaculive.com, via phone at 866.455.7223 and at the Richmond Raceway ticket office at 600 E. Laburnum Ave., Richmond, Va. on Tuesday, Feb. 12 at 10 a.m. Virginia Credit Union, RICHMOND NATION, Flying Squirrels season ticket holders and Eastern League All-Star Week sponsors will receive access to an exclusive presale for the All-Star Country Music Jam beginning on Monday, Jan. 28. "We've been saying All-Star Week will be big, and we are now taking that literally with the announcement of Big & Rich featuring Cowboy Troy performing at the All-Star Country Music Jam," Flying Squirrels VP & COO Todd "Parney" Parnell said. "We are grateful for not only our partnership with Richmond Raceway on this All-Star Country Music Jam, but also the enthusiasm Big & Rich's team has for this event. It will be a special night of memory making for all involved." "As the community comes together for the first All-Star Week in Richmond since 1992, it's fitting we're hosting the All-Star Country Music Jam at Virginia Credit Union LIVE! as it opened the same year," Richmond Raceway President Dennis Bickmeier said. "We look forward to welcoming Eastern League All-Stars and fans, along with our friends at the Richmond Flying Squirrels, to Virginia Credit Union LIVE! at Richmond Raceway as part of All-Star Week." Kenny Alphin and John Rich, Big & Rich, have blazed an indelible mark on modern country music. They have captivated a multi-generational community of listeners with their sterling songcraft and performances. Now a decade and a half into their storied career they continue to tour the country for over 100+ dates annually presenting electrifying concert spectacles of ceaseless energy and outrageous personality. In 2019, Big & Rich are on the road for the "Redneck Riviera Whiskey Presents Big & Rich's Peace, Love & Happy Hour Tour." "I want to be a fun and entertaining positive voice and entity in my community, in my country, and in the world," said Virginia native Alphin. "I hope people know that those are the things that are important to me. And when they leave a Big & Rich concert, they should feel like they've just witnessed the greatest show on earth." From Big & Rich's 2004 debut, the triple platinum "Horse of a Different Color," and their hit "Save a Horse, Ride A Cowboy," the duo evolved into one of country music's most auspicious partnerships. The record was recognized with multiple Grammy®, ACM, CMA and CMT Music Award nominations. Their subsequent best-selling collections include "Comin' to Your City", "Between Raising Hell and Amazing Grace", "Hillbilly Jedi", and "Gravity", which delivered three consecutive Top 10 hits - and their most recent collection, "Did It For The Party," debuted at Number One on the sales charts. "In the pursuit of the American Dream, if you want something, think hard, work hard, and go after it," said Rich. "There's no guarantee you're going to get it, but the fact you're allowed to pursue it is where you should find your happiness." Over the past 12 years, their signature anthem "Comin' to Your City," has fired up football fans as the theme song for ESPN College Game Day. The band has expanded their presence immeasurably through music videos and television appearances, including Rich's victorious stint as the winner of Celebrity Apprentice when he raised $1.2 million dollars for St. Jude Children's Research Hospital. Big & Rich were honored with the 2016 CRS Artist Humanitarian Award for their support of a spectrum of humanitarian efforts, from visiting individual patients in hospitals, to staging benefit concerts for the Country Music Hall of Fame and the 173rd Airborne Memorial, to their well-documented U.S. and international outreach. The duo has made a point of helping underprivileged children and families at home and abroad in struggling countries like Uganda, Sudan, Haiti and Kenya, among others. St. Jude Children's Hospital, The T.J. Martell Foundation, Vanderbilt Children's Hospital, National Coalition Against Domestic Violence, the 173rd Airborne Memorial Fund, Clean Water, the Special Olympics and Second Harvest Food Bank are just a few of their worthy causes. Tickets to the All-Star Country Music Jam will be available for purchase online at vaculive.com, via phone at 866-455-7223 and at the Richmond Raceway Ticket Office at 600 E. Laburnum Avenue, Richmond, Va. on Tuesday, Feb. 12 at 10 a.m. The Flying Squirrels operate at The Diamond year-round and are currently taking orders for season memberships, partial plan memberships and hospitality areas for the 2019 season. The Retro Brand Team Store, located at The Diamond, is also open throughout the offseason during the week (Monday-Friday, 9 a.m.-5 p.m.). Keep up with the Squirrels and upcoming offseason events by visiting squirrelsbaseball.com. Virginia Credit Union LIVE! continues to bring top musical acts and superior concert experiences to music fans in the Richmond region. The venue has hosted top national recording artists such as Aerosmith, Sting, Bob Dylan, Jimmy Buffett, Dave Matthews Band, Florida Georgia Line, and The Lumineers. This year's Virginia Credit Union LIVE! concert season looks to be one of the best in the venue's history. The 1975, one of the most popular pop-rock bands in the world, will bring their North American Tour to Virginia Credit Union LIVE! on Wednesday, May 22 at 7 p.m. The popular British pop-rock group's tour is in support of their critically-acclaimed new album, "A Brief Inquiry Into Online Relationships." The Avett Brothers, one of the top folk-rock acts in the country, perform their iconic sound to Virginia Credit Union LIVE! on Thursday, June 9 at 7:30 p.m. This will be the band's first performance at the venue since July 25, 2013. "Weird Al" Yankovic's Strings Attached tour, a high-energy, rock and comedy show featuring costumes, props, a video wall, and for the first time, the Richmond Symphony, comes to Virginia Credit Union LIVE! on Thursday, June 27 at 7:30 p.m.
JoJo Siwa's D.R.E.A.M. The Tour will be showcased at Virginia Credit Union LIVE! on Thursday, July 18 at 7 p.m. The D.R.E.A.M. tour will bring the viral Nickelodeon superstar's youthful energy to the Virginia Credit Union LIVE! stage to highlight some of her certified platinum singles. The 2019 NASCAR season at Richmond returns "under the lights" for both race weekends hosting the Monster Energy NASCAR Cup Series and NASCAR Xfinity Series (NXS) at America's Premier Short Track. The Toyota Spring Race Weekend will bring NASCAR's best to Richmond for the ToyotaCare 250 NXS Dash4Cash race and TOYOTA OWNERS 400 Monster Energy Series race on April 12-13. Richmond's Fall Playoff Race Weekend will start the NXS Playoffs with the Go Bowling 250 playoff race and host the second race of the Monster Energy Series Playoffs with the Federated Auto Parts 400 playoff race on Sept. 20-21. Richmond Raceway is America's Premier Short Track annually hosting two NASCAR race weekends, featuring the Monster Energy NASCAR Cup Series and NASCAR Xfinity Series, on a ¾-mile D-shaped oval. Richmond Raceway is a regional leader for events including sports, live music and consumer trade shows. The Richmond Raceway Complex's 1,100 plus acre multipurpose facility hosts more than 200 live events annually including concerts with top national recording artists at Virginia Credit Union LIVE! To learn more, visit richmondraceway.com, richmondracewaycomplex.com, or vaculive.com. A financial cooperative serving more than 265,000 members, Virginia Credit Union offers a variety of affordable banking services, loans, mortgages, and free financial education resources, with a focus on helping people be more confident with their finances. Virginia Credit Union is an equal housing opportunity lender and is federally insured by NCUA. For more information on Virginia Credit Union, visit vacu.org.